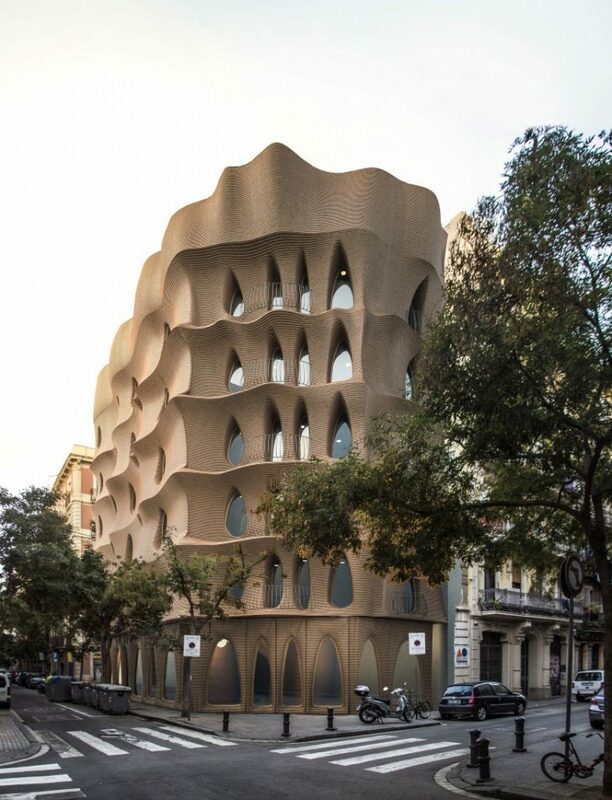 This project aimed to explore the possibilities to design and construct a multi–story passive habitat made out of the sustainable material adobe through robotic fabrication in a dense urban context. Simultaneously looking for ways to improve on the limitations of conventional construction and how this technology can contribute to site-specific factors. On-site additive manufacturing in architecture is still in its early days. There are few projects that started to experiment with this, however, large-scale robotic fabrication still isn’t a widespread method in the construction and additive manufacturing industry. The site is located in the Barceloneta neighbourhood right next to the Mediterranean Sea with a rectilinear grid of streets. In regards to the location, there were quite a few aspects to take into consideration like narrow and dense streets, shadow, sun hours, high humidity and strong winds. The design approach started with 3 main design guidelines. Firstly looking at the context, primarily for climatic reasons. Secondly, the geometry that is a constant back and forth game of structural and climatic properties. And thirdly the fabrication, how robotic manufacturing, the structural and climatic strategy works best together. 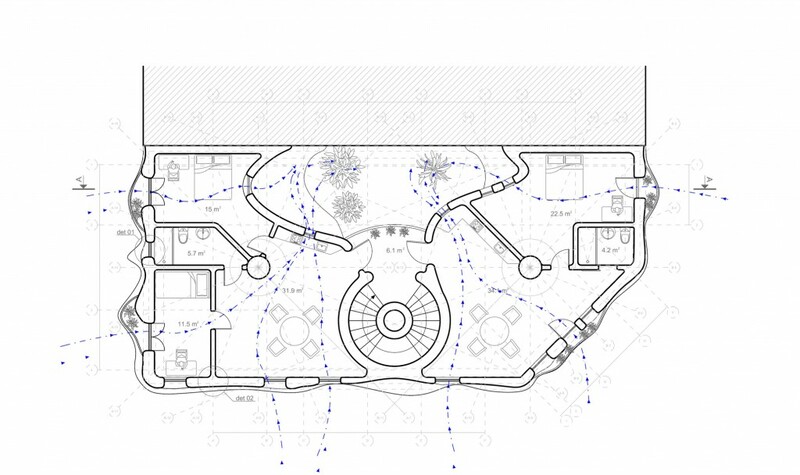 The design rules resulted in the following objectives; to reduce humidity, heat and heat exchange and to create cross ventilation in each space through natural air ventilation. To achieve these objectives, the climatic strategy is to create cavities in multiple surfaced walls, with various wall thicknesses. 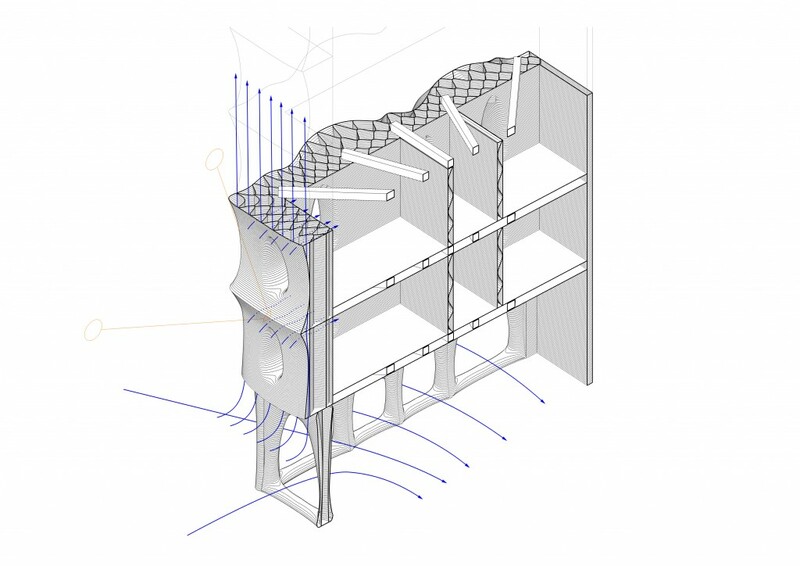 Thicker walls are situated on the south with a horizontal self-shading facade and less thick walls on the east and west facade with a verticle self-shading system with balconies. On top of that, a Catalan roof is integrated and customized windows over the entire building. Smaller windows in the upper part and wider windows in the lower part. In the centre of the building, a big patio is introduced to provide enough light and cross ventilation. The self-shading facades are a strategy in answer to radiation, based on calculations throughout the year. The wall geometry is a solution for temperature transmission and the ventilation to bring down the humidity in the interior spaces. 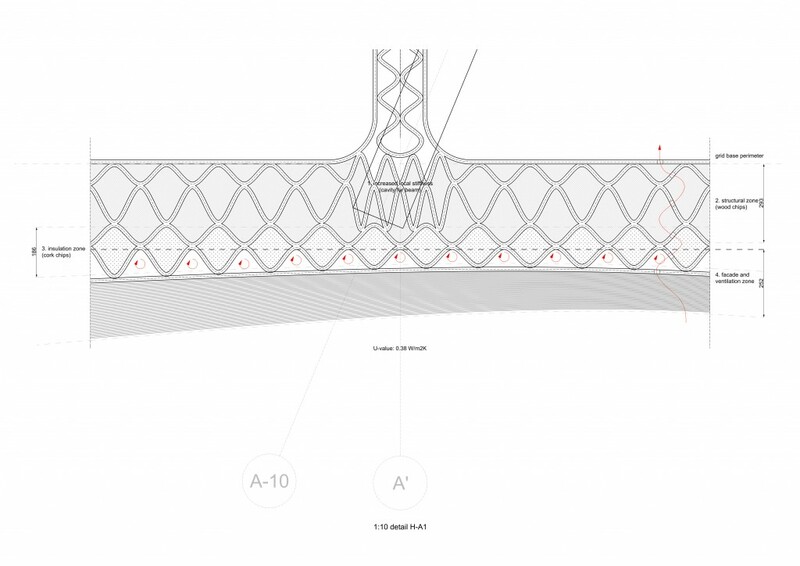 The most advantageous fabrication method in this context is on site 3D printing. Through placement of the cranes with 3 robot arms, the path of extruding the adobe is optimized. After each daily segment of printing, the adobe structure is then ventilated to allow for retraction of the material. When the height of a floor is reached, wooden beams are placed for the flooring. This process continues all the way to the top. Because of the climatic strategy and the fabrication method this project is a very site-specific and complex geometry through its customized design. The time of construction is much faster than conventional construction, material waste is kept to a minimum and this approach allows for larger and higher buildings made out of printed adobe.